In a recent interview in the local newspaper (Nadig), Alderman Levar stated that he is trying to lure a Culver's to the Foster/Milwaukee/Central area to replace a defunct Popeye's. PortPkPaul wrote: In a recent interview in the local newspaper (Nadig), Alderman Levar stated that he is trying to lure a Culver's to the Foster/Milwaukee/Central area to replace a defunct Popeye's. All Popeyes are defunct, IMO. LAZ wrote: I admit I am no aficionado of Iowa-style pork tenderloin, but Burger King's version was better than I expected -- the pork seemed to be a thin, pounded out piece of tenderloin, rather than a patty made from pressed and ground meat. I was wandering around the other day and had little choice except Burger King to get out of a torrential downpour. I had been mildly curious about their breaded pork tenderloin so I figured it was my big chance. I'm afraid I can't share your (not so enthusiastic) enthusiasm for BK's Country Pork Sandwich. There's no possible way that salty, spongy patty is a real piece of tenderloin. Stopped at Culver's for lunch today and got a walleye sandwich. Five bucks. A large piece of fish, cooked perfectly, on a fresh, unremarkable, but sufficient bun. All other fast food fish sammies pale in comparison. Cogito wrote: A large piece of fish, cooked perfectly, on a fresh, unremarkable, but sufficient bun. Nondescript bun, tasty fish. 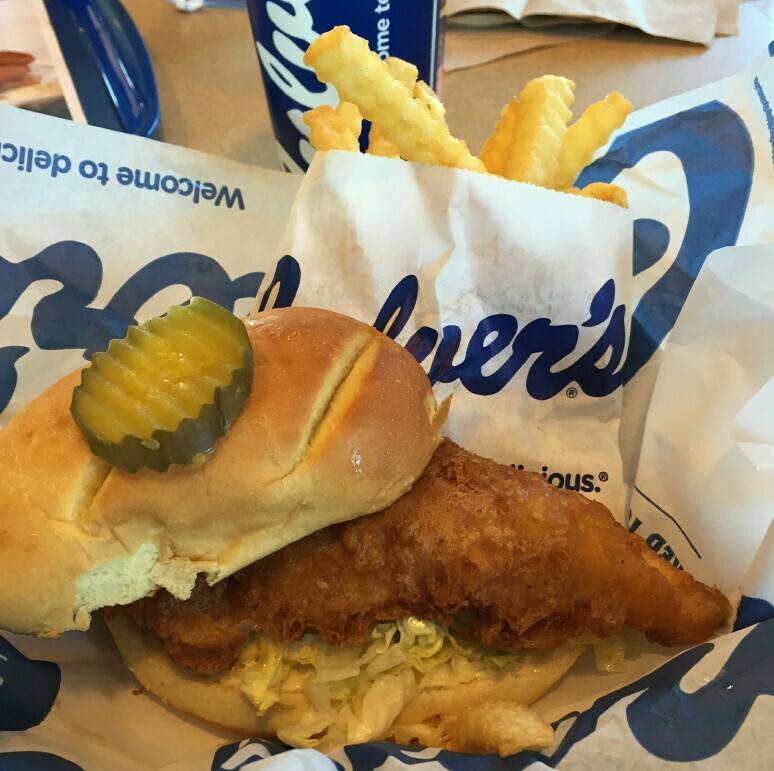 Culver's does a damn tasty walleye sandwich for a fast food chain. Culver's always strikes me as impeccably clean, friendly and, along with In-N--Out, what other fast food outlets want to be when they grow up. Agreed. Had my first visit a month ago with my three-year-old at the Libertyville location. It was her first exposure to anything remotely "fast food" and I left thinking it was a good choice. Audrey's chicken and my fish were both above my expectations along with the cleanliness and friendliness GWiv mentions. Thumbs up for this type of restaurant. Love Culvers. I usually get the butterburger. I wish their fries were better but they are okay just nothing special. An odd restaurant here and there can be pointed out saying they have cheese curds or whatever but those places are never near where I live and there are any number of Culvers I can go to or pass on my daily jaunts. I also order a bunless double cheeseburger and they are great. Believe it or not, I actually like their pot roast dinner. As you'd expect from a fast food place, it can be a little on the salty side. But I really like it. Yeah--the pot roast sandwich with the southern style green beans was a staple of my many travel-ball-related Culver's trips. Not your typical fast food fare. I really love those green beans. boudreaulicious wrote: Yeah--the pot roast sandwich with the southern style green beans was a staple of my many travel-ball-related Culver's trips. Not your typical fast food fare. I really love those green beans. Good combo. I get extra horseradish sauce on their sandwich. I've never had the sandwich. Always gone with the dinner because the mashed potatoes with gravy is the perfect combo. And Cathy, the horseradish sauce is a must! I've eaten at a few Culver's on road trips throughout the Midwest, and the quality is generally very good. I feel guilty saying it, but their frozen custard is often better than venerable mom-and-pop frozen custard stands, which can suffer from over-freezing (resulting in a product that contains ice crystals, ick) or a runny product. I've never had runny or thin custard from Culver's. It is always very thick, although one or two times, I have had an over-frozen/under-churned product. toria wrote: Love Culvers. I usually get the butterburger. I wish their fries were better but they are okay just nothing special. An odd restaurant here and there can be pointed out saying they have cheese curds or whatever but those places are never near where I live and there are any number of Culvers I can go to or pass on my daily jaunts. I also order a bunless double cheeseburger and they are great. The secret to Culver's fries is to order them "extra crispy." I was never a fan of their fries and one day while in the Lake Hallee, Wisconsin location I decided to ask the counter person if I could have my fries "well done." She replied, "extra crispy?" Why yes. These are now my favorite fast food fries. Try it, you'll like it. midas wrote: Believe it or not, I actually like their pot roast dinner. As you'd expect from a fast food place, it can be a little on the salty side. But I really like it. Agreed, very tender, but too much salt. Ms. Ingie wrote: The secret to Culver's fries is to order them "extra crispy." I was never a fan of their fries and one day while in the Lake Hallee, Wisconsin location I decided to ask the counter person if I could have my fries "well done." She replied, "extra crispy?" Why yes. These are now my favorite fast food fries. Try it, you'll like it. Also the secret to Portillo's onion rings. Wisconsin transplants, rejoice: Culver's is coming soon. And you can even live above it. Now in the final round of financing, developers expect to break ground by the end of the year at Clark Street and Cornelia Avenue — two blocks south of Wrigley Field. A few months ago Culvers began running commercials about their use of three cuts of beef. They also claimed that they seared therir hamburgers to "seal in the juices". Yes, I sent them an email, apparantly many other customers also complained. Those ads have disappeared. Tim wrote: A few months ago Culvers began running commercials about their use of three cuts of beef. They also claimed that they seared therir hamburgers to "seal in the juices". Yes, I sent them an email, apparantly many other customers also complained. Those ads have disappeared. I'm confused. What's wrong with their statements? They use three cuts of beef (so does Steak N Shake) and they sear the burgers. Sounds good to me. Searing doesn't seal in juices. Perhaps by "seal in the juices" they are referring to a "fin-footed, semiaquatic marine mammal au jus." Plenty of LTH folks would give that a go. Choey wrote: Perhaps by "seal in the juices" they are referring to a "fin-footed, semiaquatic marine mammal au jus." Plenty of LTH folks would give that a go. You're giving me ideas for next year's picnic. nr706 wrote: Searing doesn't seal in juices. Got it. But people complained about that in a commercial? Last edited by Ram4 on September 24th, 2015, 9:32 am, edited 1 time in total. I only eat locally sourced and clubbed seals. Kid Charlemagne wrote: I only eat locally sourced and clubbed seals. Those aren't seals. They're members of the Polar Bear Club. Tim wrote: Yes, I sent them an email, apparantly many other customers also complained. Those ads have disappeared. Several years ago I ate at a restaurant in Montreal that offered that very dish, as you can see on their chalkboard menu below. I would link to their website and info but they closed last year.